We recently finished a 2000 square feet part dormer part two storey house. The total costs including all fees was €187500, which is €94 / ft2. We love the underfloor heating which we installed in our newly constructed house. Home Contact ISB Featured Co. News Page Start-Up Co.
1,212 new housing units were commenced in the first four months of 2012, according to new statistics released by the Construction Industry Federation (CIF). This represents a drop of 539 units or 31% drop on the same period during 2011 when work began on 1,751 new units, according to the CIF’s latest Housing Statistics Bulletin. The Government has announced details of a new €2.25 billion investment in new capital projects. The initiate will create jobs in the education, health, justice and transport sectors. The latest figures from the Central Statistics Office reveal that residential property prices nationwide grew by 0.2% in the month of May 2012. Overall prices are down down 15.3% in the year to May. Euroconstruct is predicting that the number of new home buildings, completed in Ireland, will fall by over 40% in 2012. If correct, the number of house completions in the 26 counties, will be less than 3,000. This compares with some 90,000 homes completed in 2007. The vast majority of the newly constructed homes consist of one-off housing. The Definitive Guide to Building an Energy Efficient House is now available to purchase at all good e-book sellers. The Minister for the Environment, Community and Local Government, Mr. Phil Hogan, T.D., has announced the publication of the draft Building Control (Amendment) Regulations 2012 for public consultation. In advance of finalizing the draft regulations which are intended to facilitate a further strengthening of the building control system in order to improve the quality of buildings into the future, comments are invited from industry stakeholders, members of the public and other interested parties. In addition, for your information is a detailed explanatory note which aims to provide background material in relation to the current regulatory regime and the amendments proposed. Submissions and comments on the draft regulations should be forwarded, in writing or by email, to the address indicated below. Lane Planning & Design (www.lpd.ie) provide expert and professional advice in relation to the existing requirements. 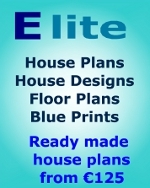 A full planning application service is also available to clients. Planning Permission were granted for 2599 houses in the second quarter of 2011 and 3043 in the second quarter of 2010, a decrease of 14.6%. with 2335 units for the same period in 2010, a decrease of 69.6%. One-off houses accounted for 34.0% of all new dwelling units granted planning permission in this quarter. The total number of planning permissions granted for all developments was 4244. This compares with 4675 in the second quarter of 2010, a decrease of 9.2%. Building costs are now at heir lowest for circa 13 years. 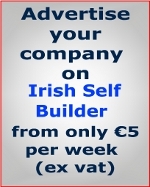 Irish Self Builder would advise anyone considering a home improvement project to take advantage of the current low construction costs. Now is the time to build that Extension, Sun-Room , Porch, Conservatory, Etc. Wicklow County Council has released details of the decline in the number of planning applications from 2007 to 2010.